All images via the official site. 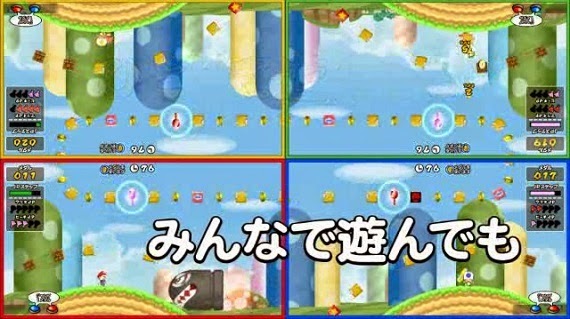 Did you know that there is/was a New Super Mario Bros. Wii-themed arcade game in Japan? Well there is! It's a pseudo-gambling game for up to four players full of minigames, slot machines, and roulette wheels. The start and primary portion of the game is a digital slot machine. You play by popping in tokens and hoping you get lucky by stopping the slots on something good. Depending on what you get, you could win a few more tokens in-game, trigger an enemy and/or power-up to appear in a minor event, or start a full-fledged minigame. Once you get past the luck of the slots, most (but not all) of the minigames are based on skill and tricky timing. Don't expect the fluid controls of a normal Mario game with the unwieldy arcade joystick though; these games tend to give you only limited control over Mario, for example, only controlling his jumps, moving platforms up and down, or shooting fireballs. 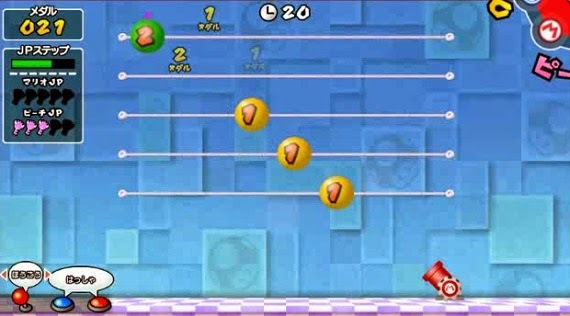 As pictured above, some of the minigames can be played with up to three other players, and their actions may affect how the game plays out on your part of the screen. "Mario Satellite - Mario Jackpot Challenge"
The ultimate goal of the game is enter "Jackpot Step Challenges" by getting lucky on the slots. These challenges are minigames with the opportunity to collect keys. 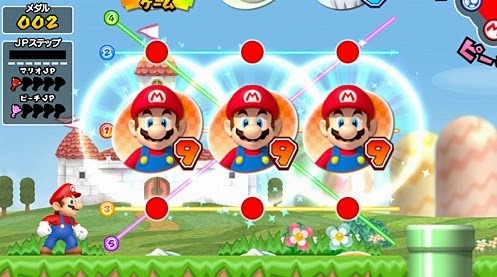 If you're able to collect five of either the Mario keys or Peach keys, you can enter the Jackpot Challenge. This is a battle against Bowser, which seems to be basically just mashing the fireball button and hoping the giant roulette wheel in the center lands on the jackpot. Presumably, if you're able to beat the odds and have enough skill when it counts, you'll be able to keep your game going long enough with real life tokens and in-game tokens to net one of the two jackpots, maybe even getting you a big enough payout of tokens to make the investment worth it. And that's about all there is to New Super Mario Bros. Wii Coin World. For more images and videos, check out the official website or search on Youtube for "New スーパーマリオブラザーズ Wii コインワールド". For more Mario stuff that's only in Japan, check out Super Mario Bros. Special, the terrible PC version of Super Mario Bros.. 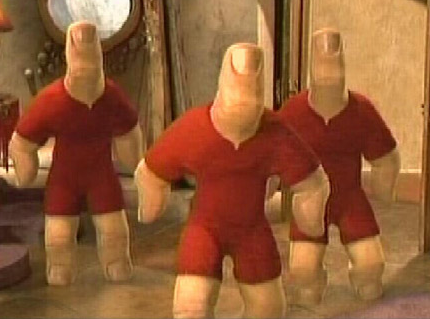 Here they are, the most poopy games around. No, not crappy - I mean, yeah, in a sense, but... Okay, look, these games are literally the poopiest. They're games with poop. That's it. Games don't usually show that kind of stuff, but these ones do. Seriously, I don't know how you got here or why I'm writing this, let's just get this over with. Cubivore is a pretty obscure GameCube game about eating other boxy animals in order to morph into new forms and become the strongest predator alive. Which form you turn into is determined by what you eat, but there are some points where it's required for you to eat certain enemies. That can throw off your desired transformation! But there's a solution: pooping. If you poop, you'll get rid of the attributes of one of the creatures you ate, allowing you to set yourself up for a more advantageous transformation. 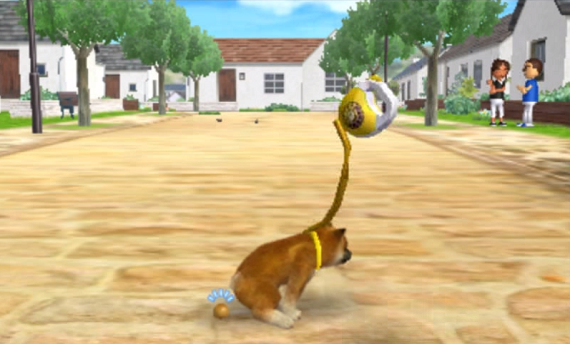 Nintendogs is a pet simulator, and anyone who has had pets will tell you that a pet simulator must have poop to be realistic. Everyone poops, ok? Dogs are no exception. Although... from the looks of it, these dogs crap out perfectly polished round turds. What are they, bunnies in disguise? I've had a dog and its poops didn't look at all like that! Screw this game; my immersion is broken. Yes, the king rat is sitting on a porcelain throne. So far all of the entries have been relatively natural occurrences of poop. This one only partially follows that theme. Yeah, Space Station Silicon Valley has a lot of animals that poop, but they aren't really animals; they're all robot animals. It's not like they have to poop to survive. Instead, these robot animals often poop as a form of attack. It turns out that robot poop tends to be explosive and works well as land mines. Aside from dropping turds as a form of attack, there's also that one level where you have to eat all the poop in the level as a rat to get a trophy. It's like a prophetic jab at achievement hunters of the future! While The Binding of Isaac bears a passing resemblance to Zelda games, it doesn't really play like one. But for the sake of explanation, you know how there are always pots to smash in Zelda games? The Binding of Isaac basically has those too, except instead of pots, it's piles of poop. There's poop everywhere. 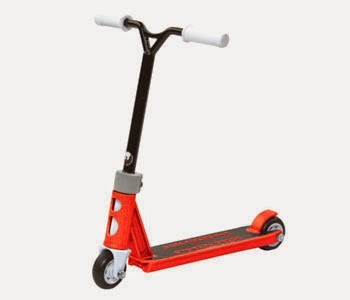 There's also an item that can make you poop. 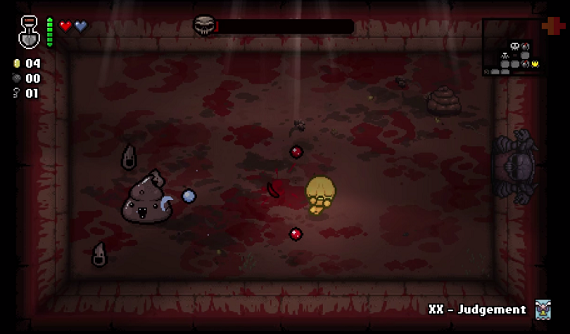 Also, as pictured, Rebirth added a bunch of new stuff including the poop boss, Dingle. I know, right? Holy crap! Aw, a game about a cute squirrel! How nice! 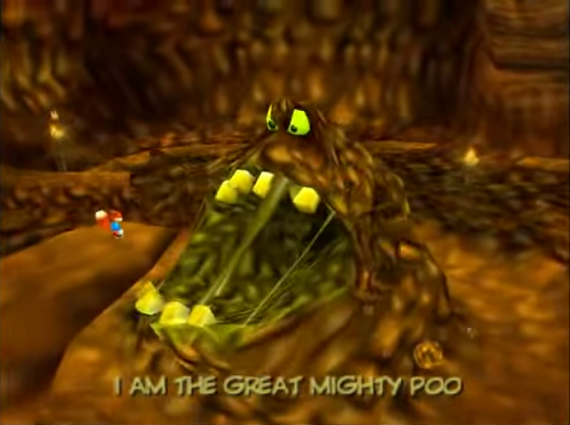 No, mom, this game is rated M, and one of its most famous parts is the giant singing poo boss, The Great Mighty Poo. It's a vulgar crap-slinging pile of excrement with indigestible corn for teeth. Its only weakness is a roll of toilet paper thrown into its mouth and a good strong flush. 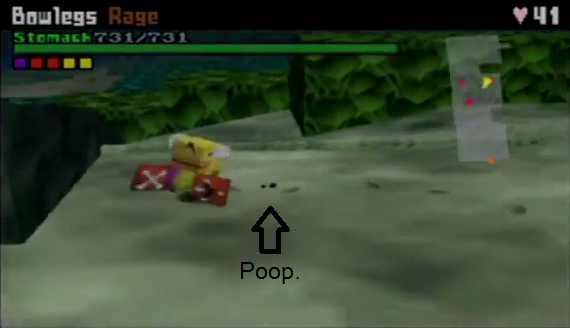 But the famous Mighty Poo isn't the only poo in this game. You also have to roll giant balls of crap around, snowball style, just to get into the Poo's chamber (all while a beautiful soundtrack of fart sounds plays in the background). 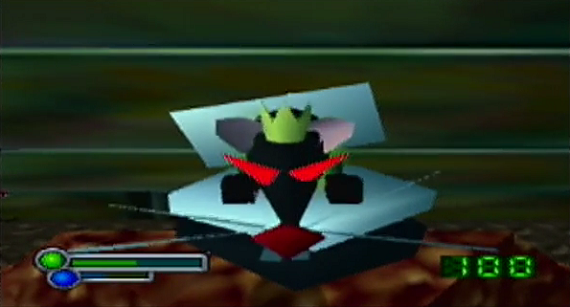 Then, later in the game when you're transformed into a bat, you can drop poop on your enemies as a mode of attack. Basically, Conker's Bad Fur Day is probably the poopiest game ever made. Honorable mentions to free online games: Don't S#!+ Your Pants and Muddy Heights.